9. S. Biswas, J. Husek, S. Londo, and L. R. Baker, “Ultrafast Electron Trapping and Defect-Mediated Recombination in NiO Probed by Femtosecond Extreme Ultraviolet Reflection-Absorption Spectroscopy," Journal of Physical Chemistry Letters, 2018, 9, 5047-5054. 8. 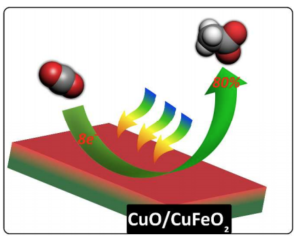 J. Husek, A. Cirri, S. Biswas, A. Asthagiri, and L. R. Baker, “Hole Thermalization Dynamics Facilitate Ultrafast Spatial Charge Separation in CuFeO2 Solar Photocathodes," Journal of Physical Chemistry C, 2018, 122, 11300-11304. 7. S. Biswas, J. Husek, and L. R. Baker, “Elucidating Ultrafast Electron Dynamics at Surfaces Using Extreme Ultraviolet (XUV) Reflection-Absorption Spectroscopy," Chemical Communications, 2018, 54, 4216-4230. 6. S. Biswas, J. Husek, S. Londo, and L. R. Baker, “Highly Localized Charge Transfer Excitons in Metal Oxide Semiconductors," Nano Letters, 2018, 18, 1228-1233. *Highlighted in Advances in Engineering. Read the highlight here. 5. J. Husek, A. Cirri, S. Biswas, and L. R. Baker, “Surface Electron Dynamics in Hematite (a-Fe2O3): Correlation Between Ultrafast Surface Electron Trapping and Small Polaron Formation,” Chemical Science, 2017, 8, 8170-8178. 4. 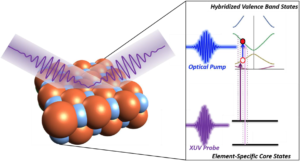 A. Cirri, J. Husek, S. Biswas, and L. R. Baker, “Achieving Surface Sensitivity in Ultrafast XUV Spectroscopy: M2,3-Edge Reflection-Absorption of Transition Metal Oxides,” Journal of Physical Chemistry C, 2017, 121, 15861-15869. 3. 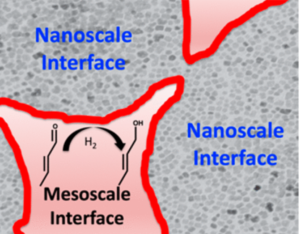 Y. Mueanngern, X. Yang, Y. Tang, F. Tao, and L. R. Baker, “Catalysis at Multiple Length Scales: Crotonaldehyde Hydrogenation at Nanoscale and Mesoscale Interfaces in Platinum–Cerium Oxide Catalysts,” Journal of Physical Chemistry C, 2017, 121, 13765–13776. 2. X. Yang, E. Fugate, Y. Mueanngern, and L. R. Baker, “Photo-Electrochemical CO2 Reduction to Acetate on Iron–Copper Oxide Catalysts,” ACS Catalysis, 2017, 7, 177-180. 1. X. Yang, Y. Mueanngern, Q. A. Baker, and L. R. Baker, “Crotonaldehyde hydrogenation on platinum–titanium oxide and platinum–cerium oxide catalysts: selective C=O bond hydrogen requires platinum sites beyond the oxide–metal interface,” Catalysis Science & Technology, 2016, 6, 6824-6835. 16. J. Y. Park, L. R. Baker, and G. A. Somorjai, “The Role of Hot Electrons and Metal-Oxide Interfaces in Surface Chemistry and Catalytic Reactions,” Chemical Reviews, 2015, 115, 2781-2817. 15. L. R. Baker, C. M. Jiang, S. T. Kelly, J. M. Lucas, J. Vura-Weis, M. K. Gilles, A. P. Alivisatos, and S. R. Leone, “Charge Carrier Dynamics of Photoexcited Co3O4 in Methanol: Extending High Harmonic Transient Absorption Spectroscopy to Liquid Environments,” Nano Letters, 2014, 14, 5883-5890. 14. 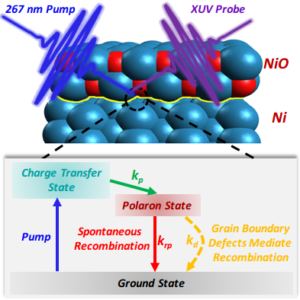 C. M. Jiang, L. R. Baker, J. M. Lucas, J. Vura-Weis, A. P. Alivisatos, and S. R. Leone, “Characterization of Photo-Induced Charge Transfer and Hot Carrier Relaxation Pathways in Spinel Cobalt Oxide (Co3O4),” Journal of Physical Chemistry C, 2014, 118, 22774–22784. 13. G. Kennedy, L. R. Baker, and G. A. Somorjai, “Selective Amplification of C=O Bond Hydrogenation on Pt by an Active TiO2 Support: Catalytic Reaction and Sum Frequency Generation Vibrational Spectroscopy Studies of Crotonaldehyde Hydrogenation,” Angewandte Chemie International Edition, 2014, 53, 3405–3408. 12. F. Shi, L. R. Baker, A. Hervier, G. A. Somorjai, and K. Komvopoulos, “Tuning the Electronic Structure of Titanium Oxide Support to Enhance the Electrochemical Activity of Platinum Nanoparticles,” Nano Letters, 2013, 13, 4469–4474. 11. K. An, N. Musselwhite, G. Kennedy, V. Pushkarev, L. R. Baker, and G. A. Somorjai, “Preparation of Mesoporous Oxides and Their Support Effects on Pt Nanoparticle Catalysis in Catalytic Hydrogenation of Furfural,” Journal of Colloid and Interface Science, 2013, 392, 122–128. 10. L. R. Baker, G. Kennedy, J. M. Krier, M. Van Spronsen, R. M. Onorato, and G. A. Somorjai, “The Role of an Organic Cap in Nanoparticle Catalysis: Reversible Restructuring of Carbonaceous Material Controls Catalytic Activity of Platinum Nanoparticles for Ethylene Hydrogenation and Methanol Oxidation,” Catalysis Letters, 2012, 142, 1286–1294. 9. 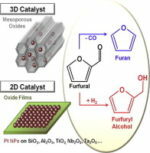 L. R. Baker, G. Kennedy, J. M. Krier, M. Van Spronsen, A. Hervier, X. Cai, S. Chen, L.-W. Wang, and G. A. Somorjai, “Furfuraldehyde Hydrogenation on Titanium Oxide-Supported Platinum Nanoparticles Studied by Sum Frequency Generation Vibrational Spectroscopy: Acid–Base Catalysis Explains the Molecular Origin of Strong Metal–Support Interactions,” Journal of the American Chemical Society, 2012, 134, 14208–14216. 8. J. M. Krier, W. Michalak, L. R. Baker, K. An, K. Komvopooulos, and G. A. Somorjai, “Sum Frequency Generation Vibrational Spectroscopy of Colloidal Platinum Nanoparticle Catalysts: Disordering versus Removal of Organic Capping,” Journal of Physical Chemistry C, 2012, 116, 17540–17546. 7. L. R. Baker, A. Hervier, G. Kennedy, and G. A. Somorjai, “Solid-State Charge-Based Device for Control of Catalytic Carbon Monoxide Oxidation on Platinum Nanofilms Using External Bias and Light,” Nano Letters, 2012, 12, 2554–2558. 6. A. Hervier, L. R. Baker, H. Seo, K. Komvopoulos, and G. A. Somorjai, “Titanium Oxide/Platinum Catalysis: Charge Transfer from Titanium Oxide Support Controls Activity and Selectivity in Methanol Oxidation on Platinum,” Journal of Physical Chemistry C, 2011, 115, 22960–22964. 5. 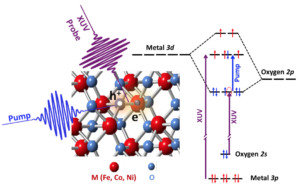 L. R. Baker, A. Hervier, H. Seo, G. Kennedy, K. Komvopoulos, and G. A. Somorjai, “Highly n-Type Titanium Oxide as an Electronically Active Support for Platinum in the Catalytic Oxidation of Carbon Monoxide,” Journal of Physical Chemistry C, 2011, 115, 16006–16011. 4. H. Seo, L. R. Baker, A. Hervier, J. Kim, J. L. Whitten, and G. A. Somorjai, “Generation of Highly n-Type Titanium Oxide Using Plasma Fluorine Insertion,” Nano Letters, 2011, 11, 751–756. 3. L. R. Baker, A. W. Orton, M. A. Stark, and S. A. Goates, “Density gradients in packed columns: II. Effects of density gradients on efficiency in supercritical fluid separations,” Journal of Chromatography A, 2009, 1216, 5594–559. 2. L. R. Baker, M. A. Stark, A. W. Orton, B. A. Horn, and S. A. Goates, “Density gradients in packed columns: I. Effects of density gradients on retention and separation speed,” Journal of Chromatography A, 2009, 1216, 5588–5593. 1. L. R. Baker, A. W. Orton, S. R. Goates, and B. A. Horn, “Characterization of Carbon Dioxide Mobile Phase Density Profiles in Packed Capillary Columns by Raman Microscopy,” Applied Spectroscopy, 2009, 63, 108–111.